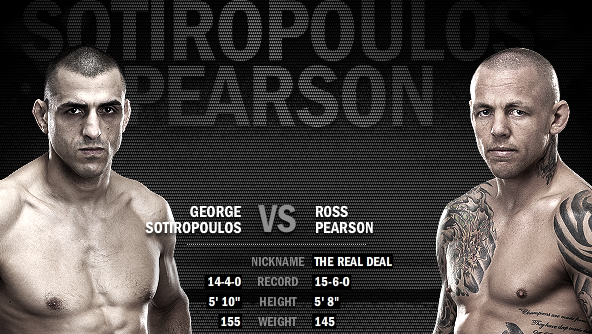 In the main event of UFC on FX 6, Australia’s own George Sotiropoulos will look to halt a two-fight skid against Ross Pearson, who is also coming off a loss. While both of these guys have had mixed results as of late, they are both effective ground fighters with top-notch submission skills, so this is an interesting style matchup that should make for an entertaining main event. George Sotiropoulos is a skilled and effective Australian grappler with great submissions and a developing boxing game. While his standup has steadily improved, he is not a knockout puncher and will never succeed primarily as a striker. Sotiropoulos’ boxing exists only to set up his takedowns and his ground game, which are extremely dangerous. Pearson is also a good grappler, but I think if Sotiropoulos can secure top position he should be able to control the pace of the fight. He just has to be careful not to get caught and wind up on his back underneath Pearson. Ross “The Real Deal” Pearson is a solid, well-rounded Featherweight who is effective in all areas of fighting but not truly great at any of them. He has serviceable boxing, solid wrestling, and a good ground game, but he isn’t the kind of fighter who can take over a fight in any one range. Against Sotiropoulos, his main focus has to be on staying off his back. If he has to work off his back against Sotiropoulos he is doomed. There is no guarantee he will win from any position, but underneath Sotiropoulos he will get manhandled. I think this fight favors Sotiropoulos in nearly every way. He is the better striker, the better wrestler, and the better submission grappler, and he should be able to easily control this fight for a routine unanimous decision. Prediction: George Sotiropoulos by Unanimous Decision.